Yesterday was elliptic_curve's last day in Montréal. At least for a good, long while. We had an absolutely delicious brunch at Réservoir, which is still my favourite gastro-pub. Now even more so, I suppose. She packed while I took a bit of a nap before washing some dishes. I helped her carry her backpack, which was really top-heavy, to the bus-stop. She was getting on the bus when I heard a sudden bang, some pylons flew apart, and people from the tam-tams started running up Parc avenue. 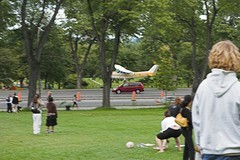 Only later did I discover that it was a Cessna performing an emergency landing. Instead of indulging my curiousity, I just went home and made pizza dough. Because, you know, taking photographs doesn't put dinner on the table. Update at 15:07: Le Devoir covers this event with a researched article. Update at 17:11 13-09-2006: The Gazette has an English article. Yeah, it landed at about 15h00. Were there snakes on the plane? I must be introduced to your friend! But really, the kitchen turns out amazing food. Of very good consistency and all. Our friend seems to enjoy it... The beer though is incredible. I wish more people understood that it's as varied, if not more, as wine. I hope you've sampled some. Let's go there. You can educate me and introduce me to your friend. I like Reservoir. No one ever wants to go there with me, for some reason. You're obviously asking the wrong people. Reassuringly part of the wacky world ... your previous theory of someone being shot was not happy making.